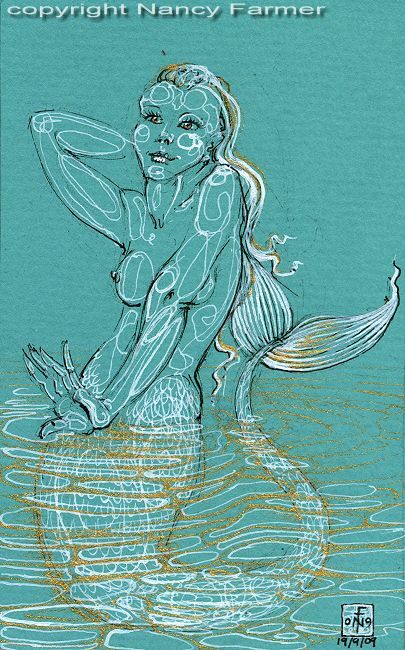 Artwork details: pen and ink on coloured paper, 3.3 x 5.3 inches (8 x 13 cm), 2009. This is one of a series of drawings I started in 2007. They are a little different to my usual way of working, since they were in no way planed, instead I simply began to draw with a permanent pen (so no rubbing-out...) and continued until I had something finished - hence 'Permanent Sketches'. None of the pieces of paper I started on were ever discarded half way through - and though naturally I believe some to be more successful than others, my opinion of which is which is not always the same as anyone else's. All this group of drawings are done on coloured paper, generally with the drawing in black and then highlights added in colours lighter than the paper, with white or metallic pens. It's an exciting way of working because I never know what I'm going to get until after I have started - they are very random and a bit deranged, but very engaging! All the 'Permanent Sketches' to date are very small - mostly around 3x5 inches. All images and prints are © Nancy Farmer. Please email me if you wish to reproduce any of these images, or see my permissions page in the 'info' section. You can now buy prints of my work (and a few originals) in my Etsy Shop. If you would prefer to buy direct from me, or you cannot find what you are looking for in the shop, feel free to email me instead: mail@nancyfarmer.net. If you are interested in original artwork, I do intend to post a list of currently available artworks in due course, but I'm in the process of moving and re-building a main website, so for the meantime please also email me for more information on originals, and also commissions.